According to Roy Morgan research, there are more Aussies drinking cider than ever before. In the 12 months to March 2013, nearly one in five Australians aged between 18 and 24 drank cider in an average four week period. This compares with just one in 25 in 2008. While young people are most likely to drink cider, there’s a steep increase among 35 to 49-year-olds too, from 3 per cent to 8 per cent over the past two years. 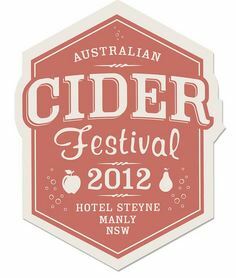 The Australian Cider Festival was first held at Manly’s Hotel Steyne in October 2012. However, there are ciders and ciders. The giants of the drinks industry are keen to capitalise on the cider trend with Foster’s relaunching Strongbow and Coca-Cola Amatil distributing a big Swedish brand with the rather ungainly handle of Rekorderlig. Wine writer Max Allen has roundly condemned these brands, along with the Carlsberg offering, Somersby, pointing out that they’re made from water, sugar and apple juice concentrates. There’s also a trend to flavoured ciders, with added raspberry, strawberry, lemon, or even ginger. The imported Swedish brand Kopparberg, for example, has mixed fruit, strawberry and lime and elderberry and lime variations.